LOCALS ASK WHY MUSLIM SETTLERS ARE ALLOWED TO INVADE TINY SCOTTISH VILLAGE RACKED WITH UNEMPLOYMENT…… – The Tundra Tabloids……. Because the EU, UN and feckless British leaders say so. These people (Jew/American haters) should be housed closer to where they came from, we are not responsible for their failed societies that dot the islamic world’s landscape. The government’s first priority is to its own citizens, this Wilsonian World Vision bull crap has got to end before it ends us. Senseless! Why are Syrian refugees being foisted on a remote Scottish island with high unemployment and poverty – then given perks some locals don’t enjoy? 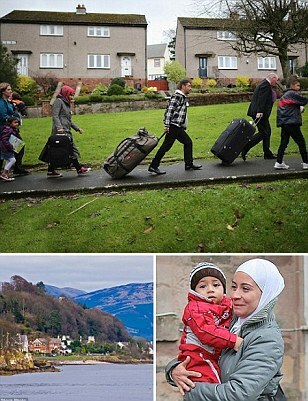 Some 15 families fleeing the Syrian civil war (main picture and right) have been rehomed on the tiny island of Bute (inset), off the West of Scotland, where they have been given free accommodation and can pray five times a day. The British government is in the process of resettling 20,000 refugees who have fled from the violence in the war-torn country, but the added perks are causing potential tensions with the locals. This week, three more charter flights arrived in the UK to help fulfil David Cameron’s promise to help refugees, which he has described as ‘our moral duty’. More here. Next Post Next Post YAZIDI WOMAN IN EMOTIONAL SPEACH BEFORE UN: I WAS GANG RAPED UNTIL I PASSED OUT BY ISLAMIC STATE THUGS…….